We had a whole butternut sitting in the bottom drawer, and half a bag of mushrooms, so rather than venture outside in the horrible weather to get provisions, I decided to make a pumpkin and mushroom risotto - but not just any pumpkin and mushroom risotto. This delicious, creamy, flavoursome risotto was comprised of roasted pumpkin and roasted mushrooms. Roasting them before adding them to the risotto added an amazing flavour to the risotto, and filled the kitchen with the smell of roasting pumpkin. 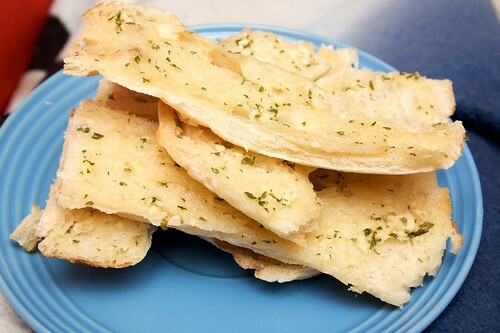 I served this with some garlic bread. It was quite perfectly timed, I put the garlic bread in at the same time as adding the pumpkin and mushroom to the rice, and pulled it out just as the risotto was ready. I used some left over turkish bread for this, sliced thinly into fingers and funny shapes and baked for about fifteen to twenty minutes. Cut butternut pumpkin in half lengthways. Lightly oil a baking tray with olive oil, and place pumpkin cut side down. Roast at 175C for about forty-five minutes. In the meantime, pat down the mushrooms. After thirty minutes of roasting, pull the pumpkin out, and add the mushrooms to the tray. You can remove the stalks (this is my preference), and throw them into the tray also. Drizzle mushrooms lightly with olive oil, and sprinkle with dried oregano. Put tray back into the oven, and continue baking for remaining pumpkin time. After returning the pumpkin and mushroom to the oven, heat some oil in a pot, and add the red onion. Fry with oregano, rosemary and parsley until the onion starts to soften, then add the garlic. Stir through, and add in the arborio rice and a cup of stock. Stir continuously, adding more stock and the wine, as necessary. When the pumpkin is ready, remove from oven. Remove the skin from the pumpkin immediately, roughly chop the mushrooms into large chunks, and add all, including the liquid in the tray, into the risotto. Also add the salt, pepper, nutmeg and sage. Allow all the stock to soak into the rice, and continue stirring, for about another fifteen minutes, or until the rice is done deliciously. Mandee, it was perfect for a stormy evening! Pumpkin risotto is great, I love it. Nora, I love roasted pumpkin - I had to stop myself from eating it as I peeled it! 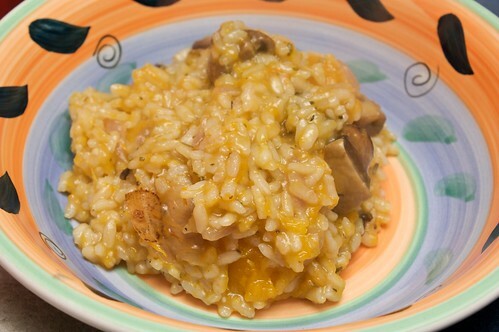 Mmm I love risotto and I love pumpkin so this sounds like risotto heaven!! Vegetation, the combination of pumpkin and risotto was great! Johanna, this was my first try with roasted veg in the risotto, it worked out great. And I'm glad it did. Oh wow, I love pumpkin risotto but for some reason I've never made it myself, I always seem to stick with mushroom. I'll definitely be trying this recipe as soon as it gets cooler over here. we made it on Friday night! it was great (we added lots of vegan parmesan and nutritional yeast though, because we're kind of addicted). I love pumpkin- I used to eat this pumpkin and toasted almond risotto in Melbourne. So good.